Our Miniature Solenoid Valves offer precision performance under extreme conditions. Click here to jump to our Online Solenoid Valve Catalog. Offered as 2-Way Valves and 3-Way Valves with four internal body configurations and three seat sealing methods, our iPolymer Miniature Solenoid Valves are suitable for a wide range of ultra-clean to highly corrosive media applications. These high purity solenoid valves are used across a range of applications and provide a durable, reliable and dependable valve. Our all virgin PTFE wetted surface design is ideally suited for semiconductor, pharmaceutical, bio-medical and chemical process applications. Configurable with a PTFE Hard Seat, FKM-Viton O-Ring Seat or FFKM-Kalrez O-Ring Seat the iPolymer Miniature Series Solenoid Valve line provides unsurpassed chemical compatibility with a wide range of flow media. Our solenoid valve for corrosive applications, utilize an all wetted PTFE body, valve stem, and one-piece diaphragm maintains a material inert boundary for both ultra-clean and corrosive applications. • PTFE design optimized for ultra clean and chemical compatibility. 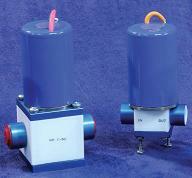 • Configurations for electric solenoid valves available for various DC & AC voltages. • Fast, accurate and repeatable coil response time from proven technology. • Continuous Duty Cycle Rated at controlled ambient temperatures. • Designed for positive flushing and bubble-tight shut off. • Diaphragm configured to completely isolate solenoid coil from media. • Coil Driven; does not require energizing pressure or vacuum to operate. • O-ring seat configurations for vacuum solenoid valve and complex media applications. • Designed for aggressive media and elevated temperature. Click here to jump to our Online Solenoid Valve Catalog. • Special port connections; combinations of pipe, tube and flared ends. • Extra long wire leads (36” or 48”). 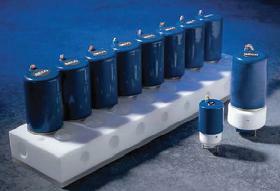 • Low Watt (6.7 watt) Coil for limited power applications. • Valves without mounting studs or with 4 mounting studs (2 standard). • Manifold mounted valve assemblies. For highly corrosive or caustic gas applications, such as Chlorine Gas, our Auxiliary Plate Option (AP) give an extra line of protection to the solenoid actuated ball valve. The valve is configured with an auxiliary plate between the upper diaphragm and solenoid coil. The AP (Auxiliary Plate) is O-Ring sealed on the Stem of the diaphragm and supported at the outer body-to-coil interface. What is the design basis for our iPolymer PTFE Solenoid Valves? We currently have two PTFE Solenoid Valve families: our Miniature Valve Series, and our Subminiature Series. Both designs are based on a flexible diaphragm member which acts as the flow control element. The diaphragm is flexible and can travel a few millimeters at its center point while constrained by the valve body at the outer edge. Our miniature water valve options are ideal in a wide range of applications, including when process temperature is a concern. The 2-Way PTFE Solenoid Valve has one machined flexible diaphragm which opens and closes the inlet port from the outlet port. 2-Way Solenoid Valves can be configured in a Normally Closed (NC) or Normally Open (NO) arrangement. The valve actuates by energizing the solenoid coil. This coil generates a magnetic field which acts on the coil armature. The armature is attached to the valve stem. The energized coil armature stem assembly actuates the diaphragm. The passive non-energized state uses a mechanical spring to maintain the design force (either the NC or NO state). The 3-Way PTFE Solenoid Valve has two machined flexible diaphragms. These two diaphragms are coupled together through the valve body with a stem connecting rod. When one diaphragm is opening, the other is closing. In the other state, the motion is reversed, and the pair of diaphragms shuttle to the other side of their travel. The nature of this 3-Way PTFE Solenoid Valve design defines a main Common Port which is connected across the two diaphragms from an A Port and a B Port. These 3-Way valves are not configured Normally Open or Normally Closed like the 2-Way valves. By default of their design, the A and B Ports are independently coupled with the Common Port across the two diaphragms. Energizing the coil shifts the armature position, which also shifts the two diaphragms. Assuming State #1: Port A is closed to the Common Port and Port B is open to the Common Port, energizing the PTFE Solenoid Valve, which results in the shifted State #2: Port A is open to the Common Port, and Port B is closed to the Common Port. All types of valves, including custom-designed options are segregated from media with diaphragms comprised of PTFE. Such valves, including plastic solenoid valves can be customized to exacting specifications. Whether pneumatic, manual or chemical resistant solenoid valves, the use of polymers is available to provide the valves with the durability and longevity they require for intense applications. However, when it comes to plastic solenoid, PTFE is a favorite. Do PTFE Solenoid Valves generate heat when energized? Yes. All Solenoid Valves generate heat when energized. The longer and more frequent the energized state, which is related to Duty Cycle, the more heat will be generated. Solenoid Valves can get hot to the touch. The actuation motion in a Solenoid Valve is created by means of a mechanical coil. Whether you are working with an AC or DC coil, heat will be created when energized. The coil is used to generate a magnetic field. The magnetic field and resulting magnetic forces draw an armature against a spring. The electrical energy (power) necessary to create the magnetic field results in heat. Our PTFE Solenoid Valves are designed to take this heat build-up. However, if the Duty Cycle is significant, the valve performance should be de-rated. High Duty Cycle applications should be carefully reviewed by the Valve Design Engineer. Duty Cycles above 50% are not considered industry standard and should be reviewed. We have special Power Management Circuits to help manage the coil temperature for long cycle applications. iPolymer PTFE Solenoid Valve are designed for high Duty Cycle applications. Please contact iPolymer Customer Service regarding proper valve selection and custom designs when duty cycles exceed 50% and when total energized periods exceed 30 minutes. When planning to buy a solenoid valve online, talk to our team before placing the order if this a concern with the application. Does iPolymer manufacture special or custom PTFE Solenoid Valves? Yes, over the years we has designed numerous special or custom PTFE Solenoid Valves for our clients. These include unique manifold arrangements, mounting arrangements, electrical connections, special low watt or extra high wattage coils. One example is our SV-111747-502 PTFE Solenoid Valve for the TF 49c Gas Analyzer vacuum applications.